Compare frozen pizzas from Coles, Dr. Oetker, McCain and Woolworths on factors including value for money, variety, taste & quality of ingredients, ease of preparing and overall customer satisfaction. 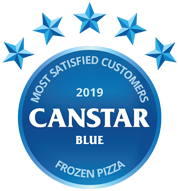 In Canstar Blue’s first customer satisfaction ratings for frozen pizzas, Dr. Oetker has claimed the top spot, with five stars for variety, taste & quality of ingredients, ease of preparing and overall satisfaction. Frozen pizza is often an underrated addition to the shopping list, with the tasty option it’s a handy meal for households that are rushed off their feet, or those who aren’t confident in their culinary abilities. With the versatility to feed a small army, frozen pizzas are also generally cheaper than most takeaway pizzas, making them easier on the budget as well. While they may not be the go-to option for those looking to make good on their New Year’s resolution, having a pizza in the freezer in case of ‘emergencies’ can give households peace of mind after a long day at work. And when it comes to choosing the pizza to stock up on, consumers aren’t short of options and flavours. But where can you find the best quality and value? That’s where Canstar Blue comes into play. In our inaugural ratings for frozen pizza, three of the four brands scored a five-star result in at least one category, but Dr. Oetker was a clear winner overall, and when it comes to taste & ingredients. Frozen pizzas are a popular option for many households, with almost two in five (38%) respondents to our survey eating frozen pizzas at least once a week, with 3% of those even eating it daily! While 76% of respondents enjoy cooking their own meals, over half (51%) eat frozen pizzas simply because they don’t have enough time to cook. A German brand, Dr. Oetker has been operating for over 100 years, covering all ranges of food, including cake mixes, yoghurts, and frozen pizzas. Dr. Oetker’s pizzas range primarily centres around the thin and crispy Ristorante-styled pizza, which includes flavours such as Hawaiian, Speciale, Quattro Formaggi and Peperoni. Each pizza is between 310g and 390g, all costing $7.50 at the checkout. 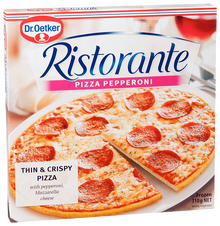 With five stars for variety, taste & quality of ingredients, ease of preparing and overall customer satisfaction, value for money was the only category where Dr. Oetker scored four stars. A Canadian company, McCain has long been a favourite for Australian households, with the catchphrase ‘Ah McCain, you’ve done it again’ a common saying in the early 2000s. Offering anything and everything within the frozen food section of your local supermarket, McCain’s frozen pizza range includes plenty of options for the busy household. With Family Pizzas, Ultra-Thin Pizzas, Takeaway Pizzas, Rustica, Pockets, Slices, Singles and even Pizza Bases, McCain does it all. Family Pizzas (500g) will cost you $6.50, while the Rustica range will cost you $7.50 and the Ultra-Thin range will scan through for $7 at the checkout. With a five-star rating on variety, McCain got four stars for taste & quality of ingredients, ease of preparing and overall satisfaction, while scoring three stars for value for money. 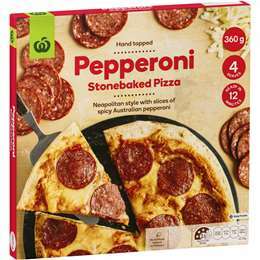 As with most grocery lines, Woolworths offers Aussies its own range of frozen pizzas, including flavours such as Hawaiian, BBQ Meat Lovers, Pepperoni, BBQ Chicken, and Four Cheeses, with the pizzas ranging in size from 360g up to 500g. The Hawaiian and BBQ Meat Lovers will set you back just under $3 at the checkout, while the rest of the Woolworths range will cost you $4, although in comparison to the other brands available on the shelves, Woolworths is certainly a cheaper option. The only brand to get a five-star rating on value for money, Woolworths scored four stars in all other categories, including taste, variety, ease of preparing and overall satisfaction. 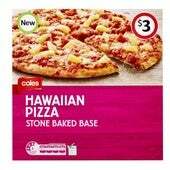 Not to be outdone by Woolworths, Coles also has its own range of frozen pizzas, each available from $3. Flavours include classics such as Hawaiian, BBQ Meat Lovers, Supreme, Margherita, and Pepperoni, with Pizza Subs also available in Meatball and Cheese & Tomato flavours. Each pizza weighs in between 470g and 500g, with the Subs costing $4.50 per 250g-270g pack. Rounding out the results, Coles was rated three stars in all categories, including taste & quality of ingredients, ease of preparing and overall satisfaction. Which frozen pizza should I buy? While frozen pizza may not be the first thing you think of when you do the grocery shopping, there’s no doubting it can be a lifesaver when it comes to getting dinner on the table in a hurry. There’s certainly a convenience factor when it comes to frozen pizza. But which brand and flavour you end up putting in your trolley will come down to your personal preferences, as some prefer the cheap and cheerful pizza and garlic bread combo from the supermarket chains, while others may prefer a bit more substance to their pizzas, and are happy to fork out a bit of extra cash for a larger meal. Canstar Blue surveyed 3,000 Australian adults across a range of categories to measure and track customer satisfaction, via ISO 26362 accredited research panels managed by Qualtrics. The outcomes reported are the results from customers within the survey group who have purchased and eaten a pre-made frozen meal (i.e. from the frozen section of the supermarket) in the last 6 months – in this case, 474 people.